My name is Katrina Lewis and I am the new Executive Assistant and Program Coordinator with the AACC. I was previously a Member Relations intern for the Chamber, but through hard work, dedication, and perfect timing, I’ve moved up in the world! I am a recent graduate of Temple University with a major in Sociology. How does that apply to my positions here at the Chamber? I am a thinker, problem-solver, communicator and high spirited advocate for the Black business community in the Philadelphia area. I am excited to continue to remain involved and invested in an organization that’s main mission is to advocate for the Black business community. One of the most recent events I coordinated was the AACC’s Speaker Series event: Women’s Leadership and Breaking the Glass Ceiling. With the help of our awesome sponsors, Archer Law, the event was a complete success! Throughout the year, I will strive to plan events as successful as this one and even better. Can you tell how excited I am!? If you have any administrative questions or any questions about programming I can be reached at chamberadmin@aachamber.org or programming@aachamber.org. I hope to see, connect and chat with all of you as we move forward through the year! We’re excited to announce our new Member Spotlight initiative! Here at the AACC, we continuously strive to highlight the amazing work of our members. Beginning in the month of July, we will feature one selected member each month on our website and social media platforms. Nominations are now being accepted and can be completed here. To be eligible for a member spotlight, you must: be an active AACC member; must have recently achieved a professional milestone or made a tremendous community impact; and did not receive a member spotlight in the past 12 months. Questions should be directed tomembership@aachamber.org. There’s still time to apply for our Young Professional Advisory Council! With this unique opportunity, council members will be tasked with building the Chamber of the future. Responsibilities include: advising the AACC on issues facing young professionals, planning and implementing related programming and events and serving as AACC ambassadors. Benefits include complimentary membership with the AACC and discounts on signature events. The deadline to apply is Wednesday, June 20. Don’t wait until the last minute. Apply today! You don’t want to miss our Juneteenth event to learn more about how you can overcome the barriers to accessing capital. 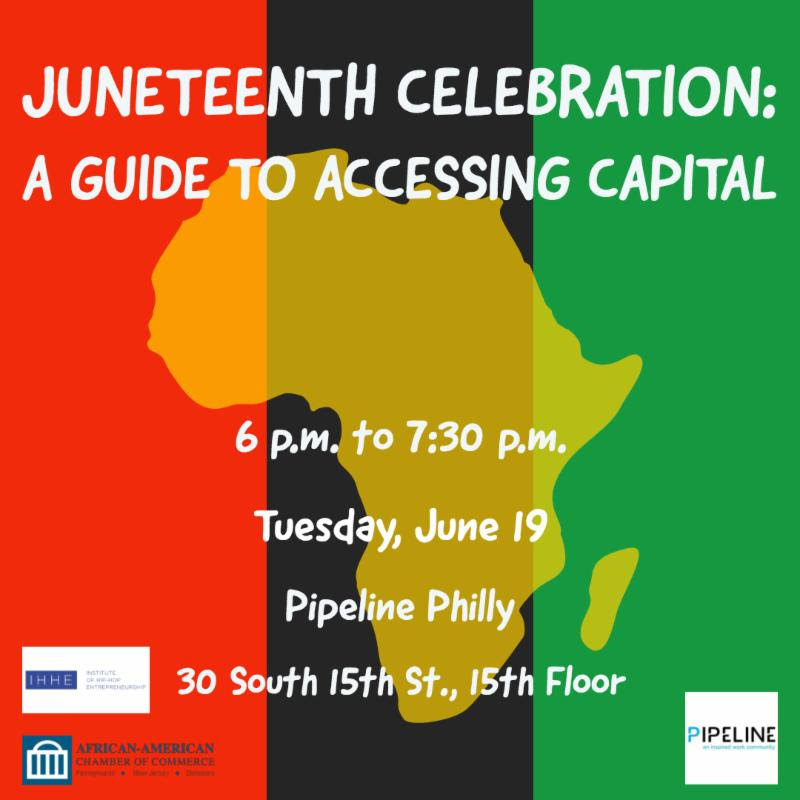 Mark your calendars for 6 p.m. to 7:30 p.m. Tuesday, June 19 at Pipeline Philly, 30 S. 15 Street, 15th Floor. We’ll be hearing from Tayyib Smith, partner at Pipeline Philly and Founder of theInstitute of Hip Hop Entrepreneurship and Sylvester Mobley, Founder & CEO of Coded by Kids. Tayyib and Sylvester will discuss their efforts in ensuring that entrepreneurs from underserved communities receive the funding and support they need. Special guests include Jade Richardson, Miss Black Pennsylvania USA 2018. Dinner will be catered by Details By Ms. Dawn. 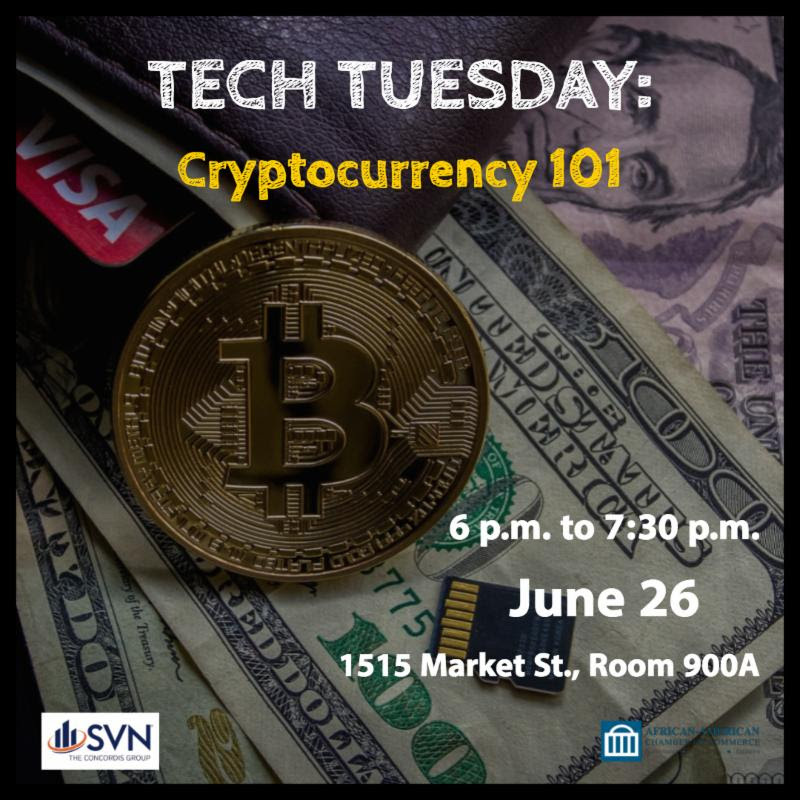 Make sure to attend our Cryptocurrency event to learn more about the digital currency and why Black business owners should start investing in it now. This event will take place from 6 p.m. to 7:30 p.m.at 1515 Market St., Room 900A, Philadelphia. The panel will be moderated by Dan Fishman of BitcoinPHL. Dinner will be catered by Details By Ms. Dawn. To celebrate Pride Month, we’re spotlighting the diverse work of our LGBTQ members. If you are an LGBTQ member of the AACC and would like to receive a spotlight, contact membership@aachamber.org. Black Restaurant Week is finally here! You can learn more about participating restaurants here. PECO announces financial incentives for AACC members. To learn more on how to save money by becoming energy efficient, visit PECO’s site here. The Philadelphia Business Journal is still accepting applications for their 7th Annual Minority Business Leaders Awards Program. Applications are due June 29. You can apply here. Join us in welcoming our newest members to the AACC! Thank you to our sponsors for your continued support! Are HBCUs effectively supporting black businesses? We are huge on black business. This is merely an attempt to encourage African Americans and others to support black businesses. It is our belief if African Americans could build a Tulsa back in the early 20th century with 600 black businesses, we know darn well we can do even greater things today – especially with over a trillion dollars in annual disposable income. Do check out our flagship, www.blackwallstreetnews.com. Do send you stories/articles and op/eds to editor@blackwallstreetnews.com.